Brazos County has taken a big step towards enhancing Career & Technical Education (CTE) in the Brazos Valley. 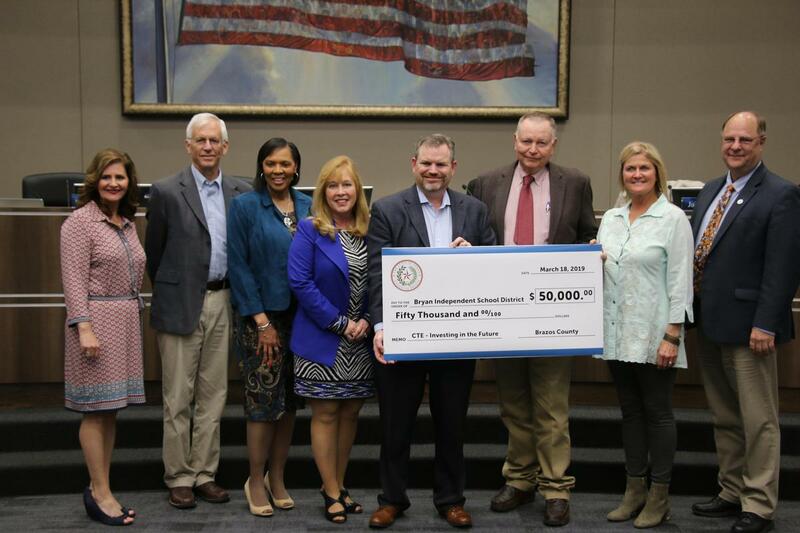 Brazos County Judge Duane Peters presented the Bryan ISD Board of Trustees with a check for $50,000 on Monday, March 18 at the Bryan ISD Administration Building to support the new Bryan Career & Technical Education Complex (CTEC). The money will be used to buy state of the art equipment for the Industrial Engineering and Robotics program. At the presentation, Peters spoke about the need for a qualified workforce to fill the growing number of jobs in the county, and the county’s support for Bryan ISD training students to fill those in demand, good wage positions. Opening in August 2019, CTEC will offer advanced coursework in Industrial Engineering and Robotics, Automotive Technology, Construction Trades and Welding. Bryan ISD identified these as critical needs jobs in our area after working with an advisory committee that included leaders from local industry, Brazos County, Texas A&M, Blinn College, the City of Bryan and Bryan ISD’s CTE staff. Located on Mumford Road near the Bryan Industrial Park, CTEC will be open to all Bryan ISD high school students. Students will travel from Bryan or Rudder High School for half-day sessions at CTEC, where hands-on learning will lead towards industry certifications upon graduation. Learn more about Bryan ISD CTE and the Bryan CTE Complex at bryanisd.org/cte.